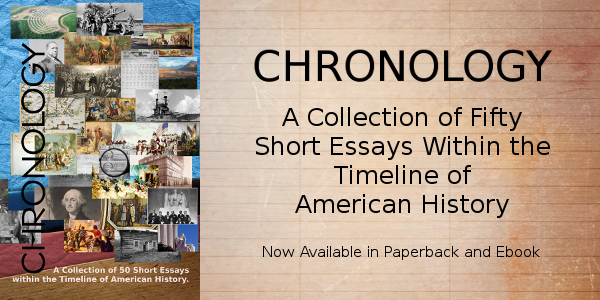 The United States was expanded and explored in many ways during the first and subsequent decades of the 1800s. We bought territory from the French in the Louisiana Purchase, make roads for pioneers to reach the Mississippi River, then sent explorers with Indian guides to breech the passes of the Rocky Mountains and find a route to the Pacific Ocean. Check out the multitude of National Parks, Forests, and other historic sites available in the states you travel through. Some little known attractions are gems. 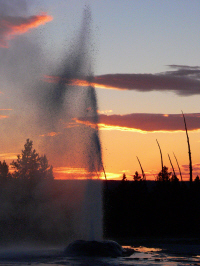 Go to the website of the National Park Service to check out state by state lists of the possibilities for your next vacation destination. Indian petroglyphs mentioned in the journals of the Lewis and Clark expedition. Nemaha River, Troy, Kansas. Courtesy National Archives. 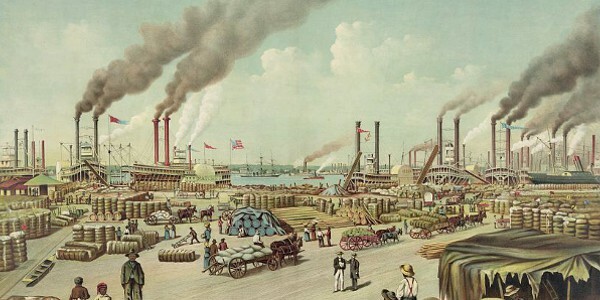 Right: Historic New Orleans wharf scene along the Mississippi River. Courtesy Library of Congress. Sponsor this page for $400 per year. Your banner or text ad can fill the space above. April 23, 1800 - The Natchez Trace post route, following an old trail running from Nashville, Tennessee to Natchez, Mississippi, is established by an Act of Congress. April 24, 1800 - The United States Library of Congress is founded. August 4, 1800 - The second census of the United States is conducted. The total population of the USA was 5,308,483 and the center of its population was 18 miles west of Baltimore, Maryland. November 1, 1800 - U.S. President John Adams is the first President to live in the White House, then known as the Executive Mansion and sixteen days later, the United States Congress holds its first session in Washington, D.C. He would be defeated for the presidency by December 6 by Thomas Jefferson. Slavery is ended in the Northwest Territory, stemming from the Ordinance of 1787 establishing the territory and written by Thomas Jefferson. 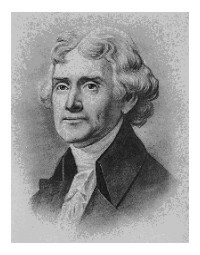 Jefferson had proposed that all slavery be prohibited by the year 1800, but that proposal had been defeated by one vote. January 20, 1801 - John Marshall is appointed Chief Justice of the Supreme Court of the United States. February 17, 1801 - Thomas Jefferson is elected as the 3rd president of the United States in a vote of the House of Representatives after tying Aaron Burr, his Vice President, in the electoral college with 73 electors due to a flaw in the original vote for two system, which would be corrected in the 12th Amendment to the Constitution. March 4, 1801 - Thomas Jefferson is inaugurated for his first term as President of the United States. May 10, 1801 - Tripoli declares war against the United States. The United States had refused to pay additional tribute to commerce raiding corsairs from Arabia. November 16, 1801 - The first edition of the New York Post is published. February 11, 1802 - Lydia Child is born and would become a foremost author expounding the idea of an American abolitionist. March 16, 1802 - West Point, New York is established. Four months later, the United States Military Academy opens on July 4. May 22, 1802 - Martha Washington, the first First Lady of the United States, passes. October 2, 1802 - War ends between Tripoli and Sweden, but continues with the United States, despite a negotiated peace, due to compensation disagreements. December 15, 1802 - Thomas Jefferson gives his Second State of the Nation address to the House and Senate, focusing on peace in the European conflict and payment of the public debt. January 30, 1803 - Discussions to buy New Orleans begin when Monroe and Livingston sail to Paris, ending with the complete purchase of the Louisiana Purchase three months later. February 24, 1803 - The United States Supreme Court overturns its first U.S. law in the case of Marbury versus Madison, establishing the context of judicial review as they declared a statute within the Constitution void. This established the Supreme Court's position as an equal member of the three branches of United States government. March 1, 1803 - Ohio is admitted to the Union as the 17th U.S. state. April 30, 1803 - President Thomas Jefferson doubles the size of the United States of America with his purchase of the Louisiana Territory from Napoleon's France, thus paving way for the western expansion that would mark the entire history of the 19th century from Missouri to the Pacific Coast. The price of the purchase included bonds of $11,250,000 and $3,750,000 in payments to United States citizens with claims against France. December 20, 1803 - The United States of America takes title to the Louisiana Purchase, which stretches the United States from the Canadian border to the mouth of the Mississippi River. February 15, 1804 - New Jersey becomes the last northern state to abolish slavery. May 14, 1804 - Ordered by Thomas Jefferson to map the Northwest United States, Lewis and Clark begin their expedition from St. Louis and Camp Dubois. The journey begins with navigation of the Missouri River. July 11, 1804 - The duel between Alexander Hamilton and Vice President Aaron Burr, longtime political rivals, occurs in Weehawken, New Jersey, culminating in the death of Hamilton. October 1, 1804 - The attack on Sitka, Alaska by Russians and their allies in the Aleut community siege a Tlingit Indian fort. One week later, the siege was complete with the driving out of Tlingit forces. October 26, 1804 - The Lewis and Clark Expedition arrives at the confluence of the Knife and Missouri Rivers, in what is now the state of North Dakota, where they camped until the spring of 1805 at the hospitality of the Mandan and Minitari Indian villages. November 4 to December 5, 1804 - Thomas Jefferson wins reelection over Charles Pinckney with 162 to 14 Electoral College votes. January 11, 1805 - The Michigan Territory is established. April 27, 1805 - American Marines and Berbers attack the Tripoli city of Derna. Land and naval forces would battle against Tripoli until peace was concluded with the United States on June 4, 1805. June 13, 1805 - Meriweather Lewis and four companions confirm their correct heading by sighting the Great Falls of the Missouri River, as the Lewis and Clark expedition continues west. December 8, 1805 - Members of the Lewis and Clark expedition upon sighting the Pacific Ocean on November 15, build Fort Clatsop, a log fort near the mouth of the Columbia River in present-day Oregon. They would spend the winter of 1805-1806 in the newly constructed fort. December 23, 1805 - The founder of Mormonism, Joseph Smith, Jr. is born. 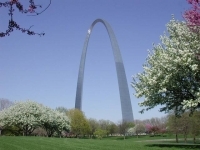 March 23, 1806 - Explorers Lewis and Clark and the Corps of Discovery begin the several thousand mile trek back to St. Louis, Missouri from their winter camp near the Pacific Ocean. March 29, 1806 - The National Road, also known as the Great National Pike or the Cumberland Road, the first federally funded highway that ran between Cumberland, Maryland to Ohio, is approved by President Thomas Jefferson with the signing of legislation and appropriation of $30,000. The highway ran through three states; Maryland, Pennsylvania, and Ohio. July 15, 1806 - A second exploratory expedition led by U.S. Army Lieutenant Zebulon Pike begins from Fort Bellefountaine near St. Louis. Later that year, during a second trip, he reaches the distant Colorado foothills of the Rocky Mountains and discovers Pike's Peak. September 23, 1806 - The Lewis and Clark Expedition to map the northwest United States ends. Essential to the journey was Sacagawea, their female Indian guide. January 19, 1807 - Robert E. Lee is born. Would become a military officer, both with the U.S. Regular Army prior to the outbreak of Civil War, and afterwards, the American Confederate General. February 17, 1807 - Vice President Aaron Burr is arrested for treason in Alabama, charged with a scheme to annex parts of Louisiana and Mexico into an independent republic. Three months later, a grand jury indicts the former Vice President under the same charges. March 2, 1807 - Congress passes an act that prohibits the importation of slaves into any port within the confines of the United States from any foreign land. It was to take effect on the 1st of January 1808. August 17, 1807 - The first practical steamboat journey was made by Robert Fulton in the steamboat Clermont, who navigated the Hudson River from New York City to Albany in thirty-two hours, a trip of 150 miles. This becomes the first commercial steamboat service in the world. September 1, 1807 - Aaron Burr is acquitted of treason. January 1, 1808 - The importation of slaves is outlawed, although between 1808 and 1860, more than 250,000 slaves were illegally imported. February 11, 1808 - Anthracite coal is first burned, in an experiment, as fuel. April 6, 1808 - The American Fur Company is incorporated by John Jacob Astor. November 4 to December 7, 1808 - James Madison is elected as the 4th President of the United States, defeating Charles C. Pinckney. December 29, 1808 - Andrew Johnson, the 17th President of the United States, is born in Raleigh, North Carolina to porter and church sexton Jacob Johnson and Mary McDonough. He would succeed Abraham Lincoln as president after his assassination and later be impeached for his role in removing Secretary of War Edwin M. Stanton. Johnson would be acquitted by one vote. February 3, 1809 - The Illinois Territory is created. February 12, 1809 - Abraham Lincoln, the 16th President of the United States, is born in a humble Hardin County, Kentucky log cabin to carpenter Thomas Lincoln and Nancy Hanks. February 20, 1809 - The Supreme Court of the United States rules that the power of the Federal Government is greater than the power of any individual state. March 4, 1809 - James Madison is inaugurated, succeeding Thomas Jefferson as President of the United States. August 1809 - The U.S.S. Constitution is re-commissioned as the flagship of the North Atlantic Squadron. Russian Block House, Sitka, Alaska. Courtesy Library of Congress. President Thomas Jefferson. Courtesy Library of Congress. Jefferson Expansion Memorial Arch along the Mississippi River in St. Louis, commemorating westward expansion, Lewis and Clark, and the Louisiana Purchase. Courtesy National Park Service.